Genes determine the physical traits that we see in each individual. They are segments of DNA that contain information that code for proteins in the body and some of these proteins determine our physical traits. Each of us has different molecular forms of the same gene within our bodies. Each molecular form of a gene -- referred to as an "allele" -- is either dominant or recessive. Dominant alleles contain the code for a physical trait that masks a recessive allele of the same gene. Some dominant genes are common, while others are rare. Controversy exists over how many dominant genes contribute to some common physical traits. Every cell in the human body, with the exception of eggs or sperm, contains two alleles of each gene. You inherit one allele from your mother and the other from your father. Not all genes are translated or "expressed" as proteins and alleles of each gene are not all identical. If you have a dominant allele of a gene, it is expressed, regardless of whether your other inherited allele is dominant or not -- meaning it doesn't matter whether the other allele has the exact genetic information or not -- dominant genes are expressed, whether there are two identical alleles or just one. Recessive alleles of a gene appear as a physical trait only when both inherited alleles of the gene are identical. The presence of freckles on the skin is one example of a dominant physical trait. 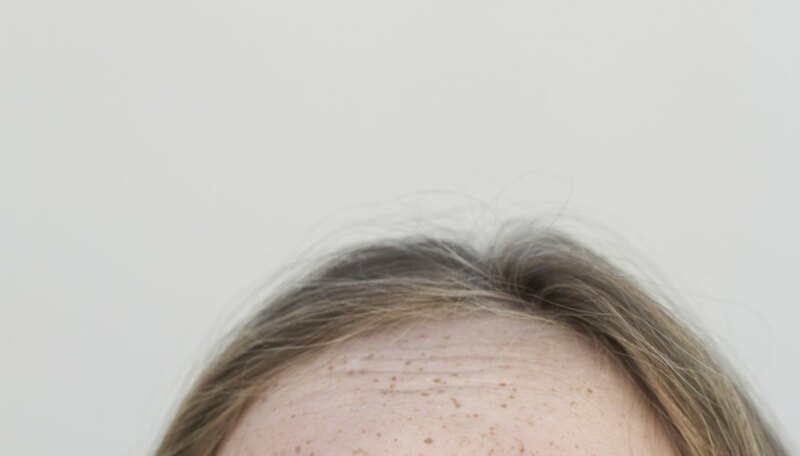 In simple terms, a dominant copy of the gene for freckles is referred to as gene "F." If the same gene has a slight change in it and doesn't code for freckles, it is considered recessive -- the recessive allele for the freckle gene is "f." If you inherit one or two dominant alleles of the freckles gene, "FF" or "Ff," you'll have freckles. If you inherit two recessive alleles of the gene, "ff," then you'll not have freckles on your skin. Other physical traits that are attributed to dominantly inherited genes include earlobe attachment style, an oval shaped face, tongue rolling ability, right-handedness, extra fingers or toes, dimples, hair on the back of the hand, curly hair and long eyelashes. Just because a gene is dominant, and it takes just one translated allele for the trait to appear, doesn't necessarily mean that it's a physical trait that you'll see frequently in the population. Some dominant genes are rare, meaning that a small subset of humans have the dominant allele. The polydactyly trait -- having extra fingers or toes -- is one example of a rare inherited dominant gene trait. If you look around at all the people you know, you may notice right away that a majority of the people you see have five fingers and toes. Having an extra finger or toe is the result of a dominant gene that is found in only a small subset of the world's population. Controversy exists over whether some dominant physical traits are caused by a single dominant gene or a combination of dominant genes. For example, naturally curly hair may not be inherited as a single dominant gene. It may be caused by multiple dominant genes. Scientists usually rely on looking at physical traits in family trees to follow dominant and recessive genes and that makes it difficult to determine if one or more dominant genes are responsible for a physical trait. However, with advances in genetic sequencing -- the ability to decode the information in each gene -- scientists can now look at individual genes and the genetic information they contain across generations to see whether or not multiple dominant genes contribute to a single physical trait. Kris Heeter is a research scientist specializing in basic cancer and disease research. Her work has appeared in several scholarly journals and online publications. Heeter has also been a wellness professional for more than 15 years, teaching healthy cooking courses and fitness classes. She holds a Ph.D. in molecular and cellular biology. What Is a Homologous Allele? Heeter, Kris. "Dominant Physical Genes in Humans." Sciencing, https://sciencing.com/dominant-physical-genes-humans-23053.html. 25 April 2017.